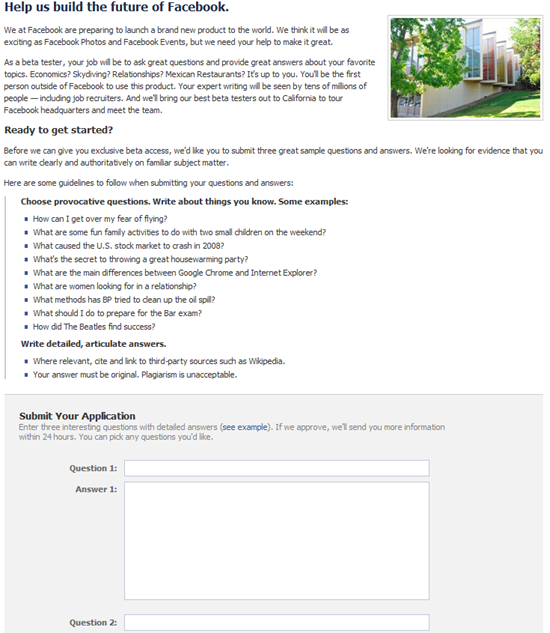 Home » Tech » Is Facebook Looking to Create a Yahoo Answers Clone? Is Facebook Looking to Create a Yahoo Answers Clone? I clicked the link, and read what it said. After reading it, to me it sounds like Facebook is going to launch a new feature probably called “Facebook Answers” which will probably be similar to Yahoo Answers, or even MakeUseOf Answers. Before they go ahead with the launch, Facebook looks like they are asking for people to write answers for them without being paid, and a few people will be selected to visit Facebook HQ. To me, this sounds like a way for Facebook to get free content without much work. Even if 1% of Facebook users respond, with 3 questions, I doubt they will send 4000000 people to Facebook HQ, and Facebook will get 12000000 questions and answers in their database. What do you guys think? Do you agree that it will be a Yahoo answers clone? Do you think that if you fill out three questions, you’ll go to Facebook HQ? Are you going to give three answers? I would like to know.